The poem precedes a suite of seven poems devoted to stages in his relationship with Marie Devlin. It acts as a kind of foreword reflecting on the force that draws objects inexorably together. It is about pull and resistance, freedom and restriction, seriousness and levity of manner. The poet prepares the ground for what the coming together of two people entails. The poet does not accept that high-riding kites have the licence to range freely. He submits that they are in fact strongly controlled (reined by strings strict and invisible). Likewise the pigeon that flies away (deserts you suddenly) is bound by an instinctively faithful impulse to return home. After they have subjected each other to barrages of hot insult often leaving them worse off (cutting off their noses to spite their face) the remorseful consciences of truly loving couples seek readmission to the native port of their embrace by saying ‘sorry’. Home-sickness provides a powerful emotional pull. 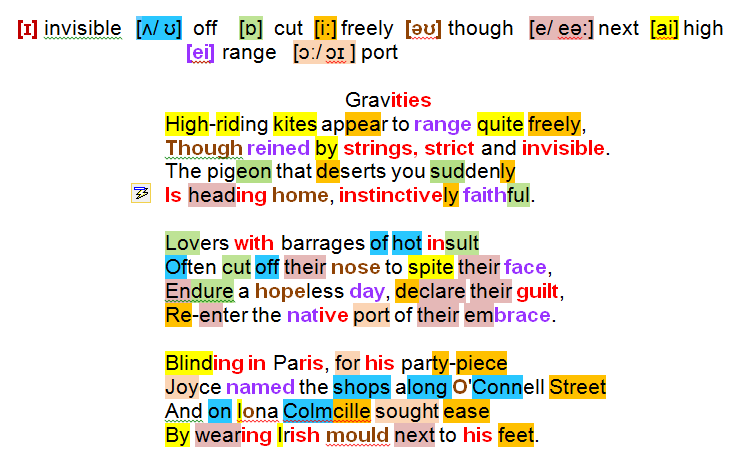 Heaney uses two Irish icons, one literary and the other religious, to demonstrate this: James Joyce ‘exiled’ in Paris was able to name the shops along O’Connell Street of his native Dublin both to demonstrate his true provenance and to prove that neither blindness nor alcohol had a negative effect upon his intellect! Similarly, as legend would have it, the missionary-monk Colmcille sought to provide himself with a constant reminder of his rich organic homeland (sought ease/ By wearing Irish mould next to his feet). Heaney’s Irish exiles: the author, James Joyce, losing his sight and boozing in Paris after 1920; Colmcille (St Columba, the ‘dove’ of the church) in exile amidst the Pictish tribes around the Scottish island of Iona in the 6th Neither of them ever shook off the gravitational pull of their Irish origins.